We love seeing something unique and beautiful! Fun stationery ideas can add a touch of exciting detail to your wedding that can be translated in your photographs forever. Here are some of our favorites! We love both of these ideas from JS Design, here in Denver. You can add stationery anywhere in your wedding – this couple chose to wrap their silverware in it! We also love the little flag in a cocktail! JS Design specializes in letterpress and does amazing inspiration designs for her clients. To learn more about letterpress, see our blog. These two ideas come from Sweet Zion Paperie here in Denver. We love the confetti found in the envelope (how festive!) and the stitched on burlap on the wedding program. Anything that combines texture and beauty into stationery is alright with us! You can also get creative with your reception using fun stationery ideas! These are courtesy of Cloud 9 Papers, and are delicate and beautiful. 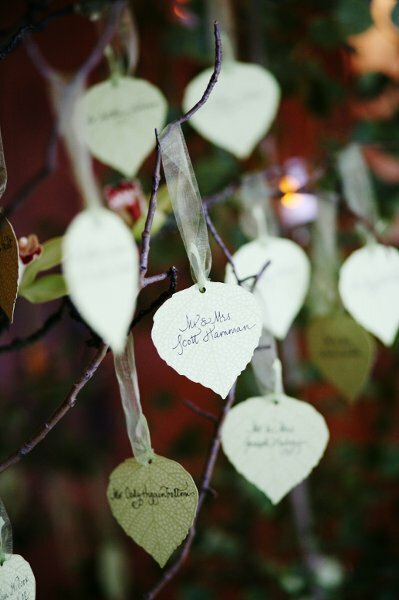 We love both ideas for guest seating – the first image has names hanging from tree branches, while the second image has the names placed in cut logs.